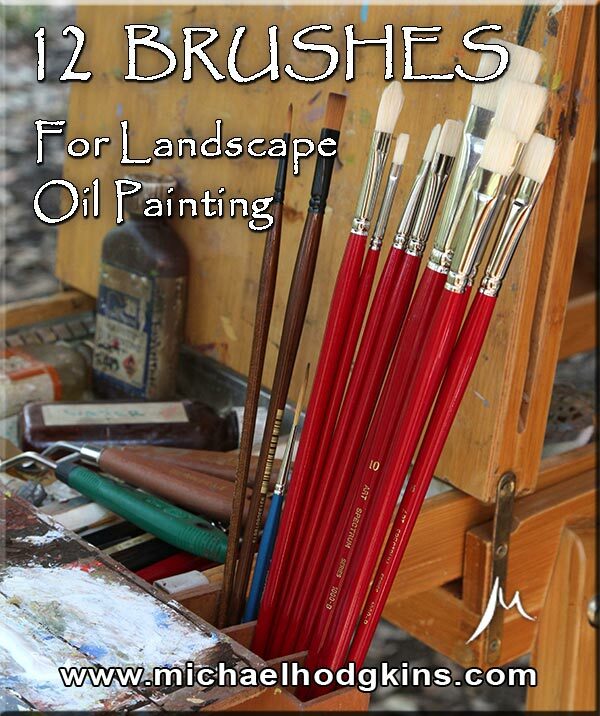 This information for artists, including a downloadable PDF, is supplemental to the video “Twelve Brushes for Landscape Oil Painting”. In the video I have shown a simple basic set of twelve brushes suitable for landscape painting in oils on canvasses up to about ninety centimetres or three feet. I have carefully chosen this selection from what could have been an almost unlimited combination of sets of twelve, all equally valid. Ten different landscape artists probably would have come up with ten different selections. The important thing however, is that for the beginner, everything is unfamiliar and confusing. With this set I have taken the indecision away and you won’t be wasting your money or effort on the wrong tools. This is as good a starting point as any carefully chosen selection and if you used nothing else while you are learning what your own preferences are, then you will be well served. To help you navigate the overwhelming array of choices and the probably not so helpful sales assistants you will encounter when buying this brush set, I have provided a simple buying guide. Print it off and take it with you to the art store. Download link is at the end of this article. Note that I have chosen these brushes to suit paint handling that is more stiff or thicker rather than very thin and fluid. If you use thicker paint to start with on your painting journey, you will find it easier to keep the painting looking “fresh” and not overworked. Beginners have a tendency to “torture” the paint surface by re-brushing over and over again, creating a mix of virtual mud and an uninteresting surface, devoid of purposeful marks and obviously out of control. If you feel that you would prefer to “brush out” your paint with fluid strokes more-so than pushing thicker paint about, then substitute “Flat” brushes of same size and type where I have recommended “Bright”. Note that some manufacturers call their “Bright” brushes “Short Flats”. Some people prefer a smooth, mark free surface and longer bristle brushes are more suited to that goal. Beware of over blending however. You may like that seamless look when standing at the easel, but the viewer standing back at a normal distance will see a characterless homogenisation with no sense of artistry. You are making a journey through a painting and there should be a record of that endeavour that is perceivable by the viewer – that is where the emotional connection lies. The marks you make are your handwriting, your language, your unique voice, independent of the actual image. Don’t smooth them out to be nothing but “white noise”. Unfortunately, brush manufacturers do not standardise their sizes. So for your sanity, I have noted down the actual approximate width of the bristles at the ferrule for each brush that I have demonstrated. Beware that with the brands you have available, wherever you are in the world, the same dimensions may be labelled a different size! I have demonstrated Art Spectrum series 1000 brushes. These are an economical middle range brush that hold shape reasonably well, wear away quicker than I would prefer and have a nasty habit of loosening the joint between the handle and ferrule. This is easily fixed with some epoxy glue and a squeeze with pliers so not really a problem. Also, this only happens as a result of vigorous cleaning where the end of the brush is subjected to some sideways forces from holding and squeezing. It doesn’t happen in normal use. They are good value, compare well with some much more expensive brushes and are infinitely better than cheapies that will lose bristles and turn into pipe cleaners almost immediately. Some other economical and mid-range Hog Bristle brands I use are Holbein, Daler-Rowney/Georgian and Mont Marte. I don’t find the Holbein brushes to be that much better than the Art Spectrum with regard to wear but they are more expensive. The Daler-Rowney Georgian brushes look beautiful, feel great in the hand and are surprisingly good to use. I find myself trying more and more of these. They’re not very expensive either. At the real budget end of the market is Mont Marte. Surprisingly, their green handled Hog Bristle brushes are really good value considering they are super cheap. My favourite filbert brushes in my kit are Mont Martes. For me they respond better than some much more expensive alternatives I also have. There are multiple types of synthetic, or imitation sable. Anything labelled “Imitation Sable” or “Im. Sable” I’ve found to be rather nasty. I have no idea what the two Roymac College brushes I demonstrate are made of, their blarb doesn’t say, but they do hold their shape really well. I’ve not had a lot of success with white Taklon in the past, and yet I tried a Mont Marte short handled 2/0 Taklon Liner when making the video and although the bulge in the handle proved awkward to me, being designed to use holding close to the ferrule, I found the point easy to control and it has held its shape well. Westart brand Prolon brushes (made from what they call “golden nylon”) are my general go-to for synthetic sables and you will see me painting fence wire with one of those in the video. They’re pretty good as Flats, Rounds or Fans. I don’t think these are available readily outside of Australia though. First place I’d start looking for a similar brush would be UK manufacturer Pro Arte and their Acrylix or Prolene brushes. One more point – brushes may be labelled for Water Colour, Acrylic or Gouache, but they are fine to use with Oils. Using Hog bristle oil brushes with Acrylic or Watercolour paint however, is not a good idea – the acrylic and/or water will destroy them. Size 1 Synthetic Sable Round: 1.5 – 2mm wide. 10-12mm long. The long handled Roymac College brush I demonstrate in the video is actually a size 2 with the larger dimensions. It performed quite well. Anything in the given size range is fine. Keep in mind that the smaller brushes allow more intricate detail. So, if you are really keen on making a very small hair width mark, get an even smaller brush. They go down to sizes below 1 such as 0,00 and 000. Very useful for neat signatures. You may not be able to find long handled versions of very small sizes because intricate work is usually done close up with short handled brushes. That’s OK too. The longer handled versions are best suited to free easel work with a full arm. The shorties are for close careful work, holding it more like a pen. Size 6 Synthetic Sable Flat: 9mm wide. 14-15mm long. In the video I have demonstrated a long handled Roymac College which has a quite firm bristle. It is a little stiffer than ideal for soft blending but is still a very useful brush. I didn’t have a lot of choice in the remote town where I bought the brushes for demonstrating but I wanted some pretty new ones for the video, not my well used collection. My personal favourite soft Flat however, for blending, applying glazes and touch up varnish is a short handled natural hair Flat with the same dimensions. Mine are old and unbranded so I don’t know if they are squirrel, ox, camel or alligator but they are beautifully soft, keep their form well and have lasted a lifetime. They may even be real sable. If you can find something like that, get it. No Name size 6 short handled soft bristle artists brush – my favourite! Another No Name size 6 short handled soft bristle artists brush – I’ve stained and sealed the handle on this one. Looks much prettier. Size 1 Synthetic Sable Rigger: 1.5mm wide. 15-18mm long. May be called a “Liner”. The only new Rigger I could find in the middle of nowhere for the video was a Roymac Revolution size 2 made from Taklon. They claim great things about this new Taklon in the blarb but I found it stodgy and didn’t hold a point well. Being a size 2 it was also a bit too big for fine line work. Also it was too soft to control easily so is probably much better suited to mediums other than oils. The Westart Prolon D111 series Riggers are the best I’ve found that aren’t too expensive. I use a size 0 generally. The Mont Marte 2/0 Taklon liner that I picked up really cheap at a discount store also performed really well. Roymac “Revolution” size 2 short handled Taklon bristle rigger artists’ painting brush – the one I feature in the video. I didn’t like it. Mont Marte size 2/0 short handled Taklon Liner artist’s painting brush – nice for really close detail with a raised thumb/forefinger grip. Holds its point well and I will be getting more of these in different sizes to try. Add some hog bristle Rounds, sizes 1 and 2. These are useful for larger linear strokes and are very versatile for foliage. Little controlled dabs can form foliage clusters. Edge qualities of bushes and tree foliage are easily softened and manipulated. Rolling a Round brush thinly loaded with sticky paint can create random marks also useful for adding foliage variety. A short handled synthetic sable size 00 or 000. Really useful for tiny detail stuff, highlights and signatures. Size 2, 4 and 6 hog bristle Flats. Once you are comfortable with the Brights and filberts of these sizes, you will appreciate the different paint handling capabilities of these longer more flexible brushes. The 2 and 4 are the same size and feel the same to use as the Filberts in the starting set, but their squared ends allow a different mark to be made and don’t smooth off the edges of the stroke. The Filbert gives you a more organic stroke whilst the Flat gives you a more sharp geometric stroke. In the event that you initially opted to buy Flats instead of Brights, now is the time to add the Brights. Fan brushes are a classic staple. If you really want to try blending the perfect mark free, graduated sky, then a medium size sable or synthetic sable Fan blender is what you need. For more random mark making such as clusters of twigs, grass etc., then a small hog bristle Fan blender will do the job. Not so much an addition than a helpful note – if you don’t know what a brush is for, don’t buy it! Think about it. Every brush type has a specific purpose it was designed for. You are not going to try and bang in a nail using a screwdriver or try to drill a hole in a piece of wood with a hammer. These may seem extreme metaphors but I have seen the exact equivalent mismatches with artists brushes many times, with the resulting lack of success. When painting, you pick up the brush you think is right and something in the back of your head chimes in a warning with “nope, that doesn’t feel right. You need something that’s a bit narrower, or stiffer, or wider, or pointed, or softer etc.” So you put it back and grab that other brush. You don’t have that other brush that you know would be a better choice. This is when you go and purposefully buy that specific brush – because now you know what you need! Finally, when your regulars wear out, you try a few different brands as replacements and find you are sensitive enough to their differences to know which brand in which brush you prefer and why. Now you really know what you are doing!